Audi A3 E-tron hybrid on sale mid-2014 | What Car? 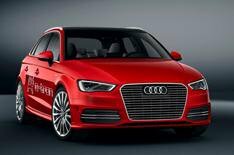 The Audi A3 E-tron hybrid will be coming to the UK mid-way through next year, the car maker has confirmed. The plug-in hybrid pairs a 148bhp 1.4-litre petrol engine with an electric motor to produce a combined output of 201bhp. This gets the car from 0-62mph in 7.6 seconds and on to a top speed of 138mph. It has an electric-only range of 31 miles. Audi also revealed that the A3 E-tron is likely to cost around 38,000 when it goes on sale in Europe, which is 32,500. E-tron technician Oscar da Silva Martins, said: 'The E-tron will sit in the range as its own trim level, and will get a good level of standard kit.